Superchips, the global leader in high performance automotive ECU tuning is delighted to announce an ECU remap for two of the most hotly-anticipated recent introductions from Japan – the Subaru BRZ and the Toyota GT86. 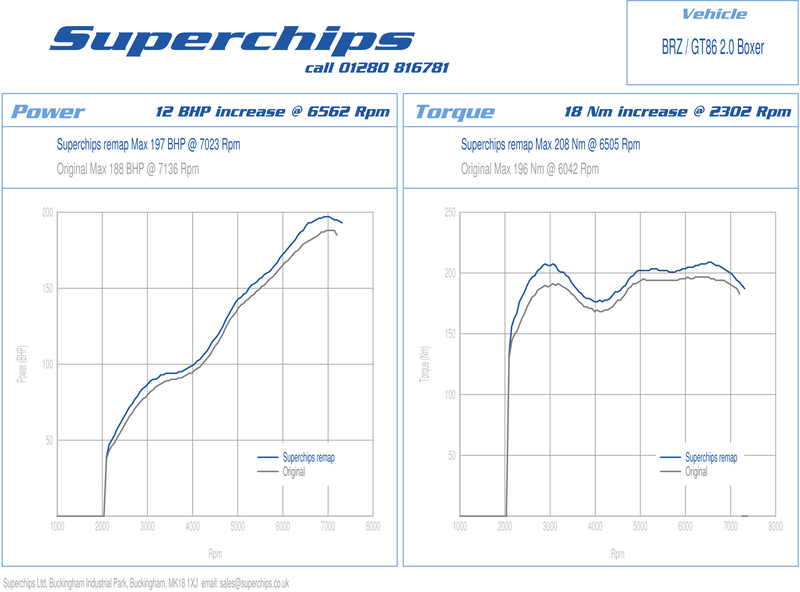 Superchips has carried out an extensive development process using its state-of-the-art dynamometer to release additional performance from the flat-four, normally-aspirated two-litre engine used in both models. Despite the fact that the engine is normally-aspirated and significant improvements are usually associated with turbocharged engines, Superchips was able to refine the fuel and ignition parameters within the DENSO management system to produce gains in power of 12bhp at 6562rpm and 18Nm torque at 2302rpm. These figures represent a 6% increase in power and a 9% increase in torque, supplementing the car’s original power and adding to the enjoyment of two of Japan’s most eagerly-anticipated rear wheel-drive sportscars. The remap will work on both original and special editions of both models, helping to counter initial criticisms that both seemed under-powered. The conversion can be carried out by any of Superchips’ UK and global dealers, using the vSpire system. This entails the owner spending approximately a hour at the dealer, who will reprogram the car’s existing ECU and have them on their way with the minimum of fuss. The cost of the remap is £249 including installation and VAT and is available for both manual and automatic versions of each model. The conversion is also covered by Superchips’ industry-leading 12-month/30,000-mile warranty*. *Terms and conditions apply – see website for details.